What's great about this cut of meat, pork loin, is that it is unpretentious in it's taste and presentation. It allows you to treat it as an earthy entree or as something that is willing to accompany other, more colorful flavors. 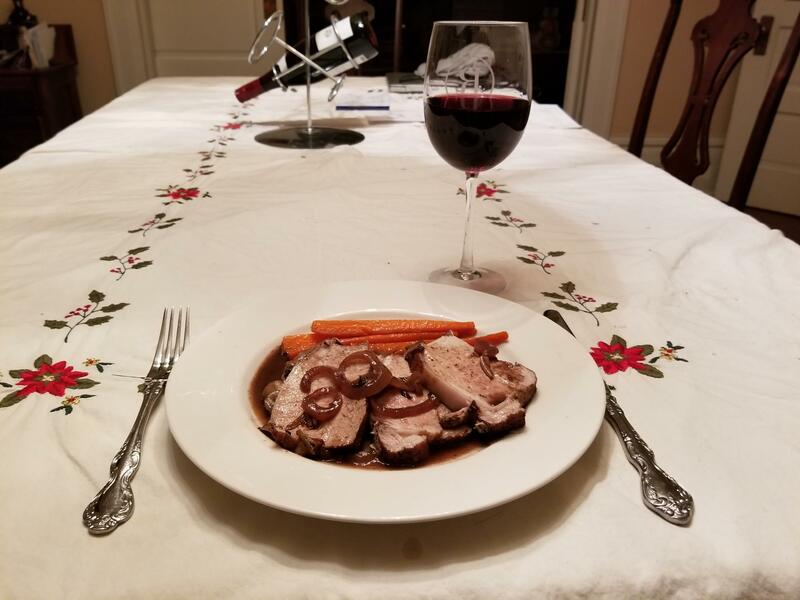 So if you want to let it pair with root vegetables, just carmelize some onions, saute some mushrooms, and add a side of carrots and plate your meal so it is visually appealing. On the other hand, if you are looking at a fruity dish, make some homemade apple sauce (it is about as simple as it can be), add a touch of cinnamon, roast some sweet potatoes, and your dish has a completely different flair. You will notice a few similarities in my recipes. First, I am a real believer in using a thermometer probe to make sure my meats aren't overdone. It allows me to concentrate on other things, without being subservient to a clock or using my finger to judge tenderness. Secondly, I love sauces that can help enhance the flavors. And last and foremost, wine is always a welcome addition to the meal, and should be paired so it is an equal partner . So, let's go make dinner! 3. thinly slice the onions and add to the pan, constantly moving them until they are translucent. Add the garlic and stir for about a minute. 4. pour in 2 cups of wine along with 2 cups of chicken broth, bring to boil. 5. place the loin in the fluids, with a probe centered in the cut of meat. Reduce the heat, cover, and simmer. 6. when the loin is 120 degrees, offset the lid to allow for some of the fluids to steam off. When the loin is 135 degrees, remove from the saute pan, tent, and monitor the meat as it climbs up to 140 degrees. 7. raise the heat to boil the fluids, reducing the fluids to sauce consistency. 8. slice the pork cross-wise into 1/2" portions, serve with a spoonful of sauce across the top. 9. pour a glass of Cabernet Franc and toast to your recent success!